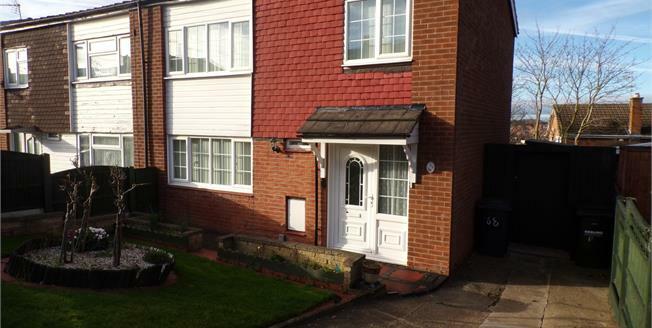 MUST SEE Three bedroom, semi detached family home. The property benefits from views over Arnold, a conservatory and superb location! Accommodation comprises; entrance hall, downstairs WC, living room with sliding doors to conservatory, fully fitted kitchen. Stairs to landing, first double bedroom, second double bedroom, third single bedroom and family bathroom. To the rear is an enclosed garden with patio and laid to lawn areas, whilst at the front is a driveway with garden. Call us now to arrange a viewing urgently! UPVC front double glazed door, opening onto the driveway. Double glazed uPVC window facing the front. Laminate flooring, under stair storage. Double glazed uPVC window facing the front. Laminate flooring, tiled walls. Low level WC, wall-mounted sink. UPVC sliding double glazed door. Double glazed uPVC window facing the front. Carpeted flooring. UPVC French double glazed door, opening onto the garden. Double glazed uPVC windows facing the rear and side. Tiled flooring. Double glazed uPVC window facing the rear. Tiled flooring, tiled walls. Roll top work surface, fitted wall and base units, belfast style sink. Double glazed uPVC window facing the rear. Tiled flooring, tiled walls. Low level WC, panelled bath, shower over bath, pedestal sink.